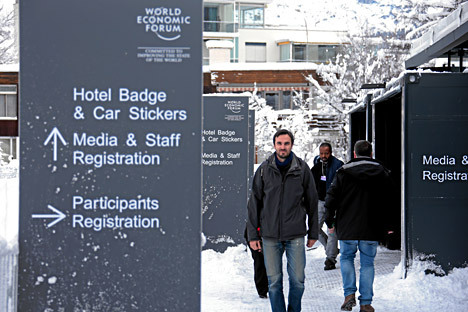 The preparation work for the upcoming Annual Meeting 2016 of the World Economic Forum in Davos, Jan. 14, 2016. In 2016 the main risks for Russia and its neighbors will be budget deficits, hyperinflation and unemployment. Being an energy superpower and possessing the second largest nuclear arsenal in the world, Russia will continue playing an active role in geopolitics, says a report based on a survey of 750 members of the World Economic Forum and published a week before the official opening of the World Economic Forum in Davos, Switzerland on January 20. "After the annexation of Crimea no clear political solution to the current conflict in Eastern Ukraine can be seen on the horizon. The EU-U.S. sanctions in place against Russia combined with low oil prices have damaged the Russian economy, but still have not led to the expected political turnaround (from Moscow)." The desire of leading powers to contain Russia contradicts their overtures of cooperation with them in the fight against ISIS. Russia's future depends on the balance between modernization and support from oil exports, as well as the fact that the current government more and more often looks eastwards with the hope of strengthening political-economic ties. Western countries, which have reduced their defense spending and are busy solving domestic problems, may encounter a lack of resources and political will to follow through on their long-term strategic goals. However, Russia is faced with non-geopolitical challenges, as well. In 2016 Moscow and its partners in Central Asia (in the report they are grouped together in one region) face a 100-percent likelihood of encountering a budget deficit due to the fall of oil prices and a decrease in domestic demand. The relative falling of prices of goods from this region on the world market will not help the state treasury replenish its reserves. “Conditions of average prospects of economic growth in the region will lead to unemployment, which is one of the five most significant risks,” according to the study. Analysts predict that there is an 86-percent probability that Russia and its neighbors will experience inflation. This situation will be brought about by the devaluation of national currencies in relation to the dollar, the reduction of state reserves, hyperinflation similar to what Russia witnessed in the 1990s, as well as the probable inability of the government to carry out deep structural and budgetary reforms necessary for supporting economic growth.